Both were top-selling quality machines. The Elswick Cross Truss was particularly popular in the British Colonies, as it was more sturdily built so coped better with unmade roads. It remained Elswick’s flagship model until 1937, when even Raleigh’s X Frame production had ended. With exports in full swing, the 192os were peak production years for Elswick’s famous Cross Truss. This model was one of Great Britain’s most distinctive bicycles. Although we now look at vintage cross frame bicycles in terms of their interesting designs, when they were introduced at the turn of the century it was in response to public worries about frame strength. At 41lb, Elswick’s cross truss is not a lightweight machine: instead it was made with longevity in mind. The other factor in the public mind in the early 1900s was suspension: spring frames and cushion frames had made their appearance by 1898. Although, in retrospect, they can be seen as a bit of a gimmick – experimentation with suspension was actually to help companies design bicycles suitable for mounting engines – cross frames did provide extra ‘spring’ and you can feel this when the bicycle is being ridden at speed. I recently bought this machine from my friend Ray, an avid long-distance cyclist. After buying it in 2006, he set it up for serious riding and has used it on many 100-mile rides. He told me that though it’s not a lightweight machine, it rides fast and well. It was repainted many years ago. When Ray bought it, the handlebars fitted were incorrect, so he replaced them with original Elswick handlebars. It has a replacement Elswick transfer (decal). It’s in very good usable condition, mechanically restored and with a practical Sturmey-Archer Model K5 three-speed gear. Cross frames are a fascinating, unique style of bicycle. They have invariably been snapped up by collectors worldwide in recent years. But the Elswick is more than just a cross frame. Its twin down tubes cross to create the ‘cross truss’ that is its trademark feature. This is a unique opportunity to own one of these sought-after machines. The easy way to identify an Elswick cross-frame is to observe the bottom tubes. Elswick’s design was unique, with the tubes crossing each other. Raleigh had already patented the cross-frame design, and cross-frames were their top product in the early years of the twentieth century. To try to avoid paying patent fees, other manufacturers who wished to cash in on Raleigh’s success had to create a different style. 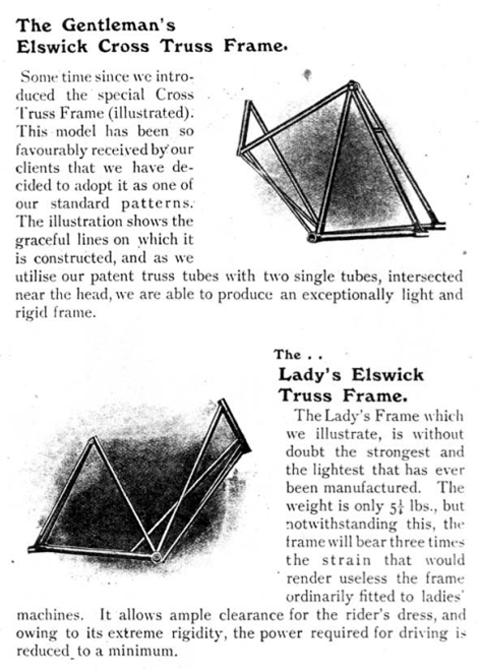 It is often referred to as a ‘cross-tube’ but, as you can see from the catalogue below, Elswick themselves describe their patent design as a Cross Truss Frame.